After upgrading to the new WordPress 3.1 my category archive (i.g Moblog) stopped working. It was showing the home page but with the category URL. 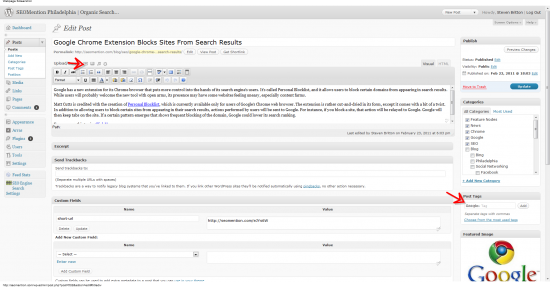 After deactivating all the plugins I've found it was the Simple Tags Plugin (reported here). I upgraded WP 3.1 recently and my moblog category works correctly, I don’t use Simple Tags Plugin, I just use Postie plugin. Yup, it looks like certain code inside the plugins breaks the permalinks. I’m having a similar issue; however, I’m not using the Simple Tags Plugin installed. Basically, my issue is when making a new post in the admin tool, most of the buttons are not firing their respective scripts. For example, I can not make links, insert media, or add new tags. Here’s a screenshot pointing out some of the buttons- when I click, absolutely nothing happens. If this doesn’t solve your category/tag link list 404’s (pulldown and top level menus) when you have a custom permalink for Blog Posts, try this “action” function. It’s worked on every site I’ve tried (including multi-sites) WITHOUT having to tinker with .htaccess, change the existing permalink structure, or disable any installed plugins. The problem is with 3.1’s canonical redirect. Sometimes, just disabling the redirect fixes the pblm. But, if this doesn’t solve it for you, here’s a more extensive alternative hotfix link. Just put the code in your theme’s functions.php file. Thanks. This link is useful and resolves my problem. Cool. Hope it helps those who are struggling with this 3.1 upgrade issue. BTW, you have some cool code snippets here! I was having the same issue with categories on upgrading to WP 3.1. I just upgraded SimpleTags to Version 2.0-beta9 and the problem is resolved! This was a great little fix! Thanks man! but my categories still not found. Every time i set permalink to /%postname%/ it roll back to Post name: http://xxxx.com/sample-post/ when i save it. 4.787.452 post views so far. This page needed 42 queries to load.